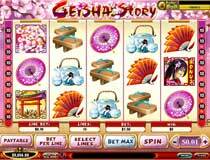 Geisha Story video slot features a special bonus round, the Geisha Garden Bonus round, which you can trigger by spinning the Scatter bonus symbol on reels 1 and 5. Lo and behold, the Chinese screen slowly opens to reveal two beautiful Geisha Girls inviting you to pick a fan – choose carefully as this will decide how many Free Spins you get! When you’ve chosen your number of Free Spins, even more fans are displayed from which you have to select just one, and this will decide your multiplier for the Free Spins – cool huh! Free Spins start at 4 and go up to 20, and the multipliers range from 2x to 10x! So if you’re really good at finding the winners you’ll end up with 20 Free Spins at 10x multiplier – giving you a huge boost on your winnings! 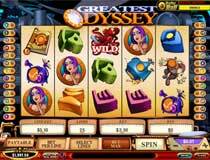 Greatest Odyssey Slot looks exactly like the inside of a submarine, you’ll love the atmosphere, with the eerie sound effects, transporting you to another world beneath the sea! Lucky Spins are triggered when you get 3 or more Treasure Book icons which are scatter symbols . Depending on how many Treasure Books you get, you’ll also get a Lucky Spin multiplier of 2x, 10x or 25x during your Lucky Spins. You can also re-trigger the Lucky Spins indefinitely within the round – so if you’re having a really lucky day both you and your bank manager will be delighted!! And we haven’t even mentioned the special Bonus Round yet – it’s a wee bit elusive as you need 3 or more bonus symbols on a winning payline to trigger the Bonus Round. You’ll know when you get there as a funky goddess in massive platform shoes invites you in to the magical underwater laboratory. You can choose 3 to 5 items as a reward, each with a Cash prize hiding underneath – guaranteed to boost your balance in a flash!